The only thing worth reading in the EIS are the letters and comments from individuals. Decades from now, when the era of flying saucers and teleporting (as in 'Beam me up, Scotty') arrives and the military's idea of "force projection" has moved off planet and from Guam, people will still read these letters to discover what the island thought at this turn in its history. The EIS isn't a planning document; it's a emotional trigger. The emotional response can appear in almost any issue affected by the buildup. A good number of people, for instance, cited a fear of crime from this concentration of troops and the off-island populations arriving to support them. (There were 274 letters out of 10,000 on this topic, says EIS comment summary in Vol. 10). The EIS seeks to mitigate risks, but each risk it addresses compounds fear that the buildup brings too many threats. The mega-risk are geo-political: "Guam’s higher military profile could increase its potential as an American target for terrorists and adversaries during a possible conflict," wrote the Congressional Research Service this year. The EIS answers that concern with an entire chapter that considers a missile defense system for Guam. The military isn't taking Guam to a prosperous future, it's taking the island back in time, specifically to the Cold War era of the 1950s-1960s when elementary school students were trained to 'duck and cover' and react like turtles in the event of a Soviet attack. One Guam, Green Guam or Isle of Fear. Take your pick. Guam is being turned into the new century version of Dr. Strangelove, with missile defenses and sirens against the unknown enemy. A diorama of the planet's future. If the vision for Guam is one of increasing external and internal threats, what then best describes this world? For an answer, we have this EIS letter by a Guam high school student. * It immediately disarms the reader into believing one thing, and then quickly moves to its real point. It’s the work of a talented writer. A literal response to black clouds and oxygen depletion are exploding missiles, but in the student's essay the arrival of black clouds is about disappearance and loss. It reminds of this beautiful post by Drea of Waiting for Wonderland about the legend of a very big fish that was eating the island and what the women of Guam did to save it. Thousands of brown wing bodies with underbelly white stripes moves as flashes across the beds of forests, and their shallow nests were built into the ground. Think of open mouths and morning sunlight. I know two things about Guam. One is that right after World War II the U.S. “accidentally” let the brown tree snake into a cargo ship on its way to Guam. Since the ko ko couldn’t fly they were devoured – nests, chick, origin and all. The other things I know about Guam is that Spain imported carabao, a species of water buffalo, in the seventeenth century. They have been a national symbol and the herds were plentiful. They are used to pull carabao boats, are ridden in festivals and are silent creatures unless startled. Since they dwindled the U.S. Naval base came to the rescue and offered a preservation “protected” by the military but really ended up serving as a field of extermination. They were contaminating the water supply on the U.S. occupied Naval Base which doesn’t belong where it is to begin with. I feel like the ko ko bird. My nest was on the ground. I was a flash in the forest. I took to the water. You came in accidentally and saw my natural habitat as a feast, now the nest is decimated and you’re perched in the highest tree looking out over a land you know nothing about but claim with pride – Volume 10, Individuals Part 1. Page 32. This following letter makes more expansive detailed points about the buildup, but it’s introduction is stirring. The last line is near the end of the letter. Whenever I got to the beach and take my dog for a walk I cannot help but to admire the beauty that lies right in front of my eyes. The beautiful soft white sand that glimmers when the rays of the sun shines down on them, the magnificent horizon that seems like it never ends and the playful waves that say hi to me whenever I come around. These wonderful creations make me feel like I am living in a paradise. A paradise that the next generation would not be able to see anymore if I let the military buildup take everything away to the place I called my home. … the military buildup is not the hope the island has been waiting for. -- Vol. 10, Individuals Part II, Page 1229. * Even though these comments are part of a published public record, I left the names out to keep from sending the authors into the search engines. That may be an easily fixed mistake. But because this material is difficult to locate, something ought to be done to improve access to the hundreds of other letters that deserve a wide audience. References at the end of each letter should make it easy to see the original. These letters were typed from the pdfs, so any errors are mine. To find PDF files, see Guam EIS Final Documents. Click on Vol. 10 and individual sections will appear. PDFs are large, more than 100MBs each and it's why I didn't link to them directly. Photo at the top of the page is from: Vol 10, Part 3, Page 124. It is a work by Anonymous, titled: "Please Print Clearly." On the northern coast of Guam, ringed by sheer limestone cliffs, lie the remains of an ancient village of the Chamorro, the indigenous people of this island, which is now a U.S. territory. The archaeological riches at Pågat are significant: more than 50 mounds (or middens) containing evidence of day-to-day life and some 20 sets of lattes—limestone pillars, crowned by capstones, that once supported dwellings made of wood and thatch. To see all of this requires heroic stamina. A hike along the trail to Pågat cuts through dense jungle and makes a steep descent past a sinkhole cave filled with freshwater pools. Access to the site and the integrity of its archaeological resources may be threatened by the U.S. military's plans to relocate about 8,600 Marines and 9,000 dependants from Okinawa to Guam. The people from Washington who delivered the news this week about Pågat would never accept a firing range near their own homes and their families. They most certainly would not let it destroy a historical site. They would protest and fight it with every ounce of strength. And they know it. But this is how the U.S. acts when there are no political consequences, a fact that is as true for Guam today as it was 64 years ago this month for the displaced people of the Bikini Atoll. After the U.S. had relocated the residents of Bikini to another atoll, U.S. Senator Carl Hatch (D-NM) visited them and said this: "The President knows the sacrifice you have made and he is deeply grateful to you for that." Hatch then gave the islanders some gifts; a collection of things, some of which may be have been purchased in an airport gift shop. "A pipe, a cigarette holder, matches, a carton of cigarettes and a complete set of photographs of the atomic cloud over Bikini,” reported the New York Times on July 16, 1946. History doesn’t record what the Bikini islanders thought of these gifts, the matches, the cigarettes and the photos of atomic bombs exploding. But people on Guam may begin to imagine. The U.S. is treating the People of Guam as it treated the People of Bikini. Guam is not being given a choice as it faces a great loss, and what it will get in return is equally empty thanks. Bikini residents had no voice and no one in Washington to speak for them. Guam has U.S. Rep. Madeleine Bordallo. But Bordallo isn't seriously fighting the military's plan for Pågat; there is no resolve in her words. In Bordallo’s “statement on the Final EIS,” she thanks Nancy Sutley, the chair of the White House Council on Environmental Quality, Deputy Under Secretary of Defense Dorothy Robyn, and Assistant Secretary of the Navy Jackalyne Pfannenstiel for visiting Guam. “The fact that these high-ranking officials are visiting Guam is much appreciated and shows the commitment of the White House in hearing our island’s concerns.” Why Bordallo would show appreciation to these messengers or inflate their status in Washington is misleading. The only person in this group with White House influence is Nancy Sutley, the chair of the White House Council on Environmental Quality. She appears to focus on clean energy and conservation. It is nonetheless gratuitous, as well as meaningless, for Bordallo to suggest that the White House is showing "commitment" to hearing Guam's concerns as they prepare to use Pågat as a firing range. In Washington, Robyn and Pfannenstiel are mid-level appointees who probably aren't on the White House’s email list for senior advisors. They work for Defense in any case. They were sent to the island not to negotiate but to deliver bad news. They are part of the Obama administration’s Blue Collar appointee workforce. Bordallo has no power in Washington, but she does have a platform, a voice and means to get a message out. But because Bordallo supports the buildup and appears too close to these officials, her language is not of protest. Bordallo is muting her language because she is not seriously concerned about Pagat. That would have been start. Bordallo’s next step should have been to call someone from The National Trust for Historic Preservation Trust to join her for a press conference about Pågat. 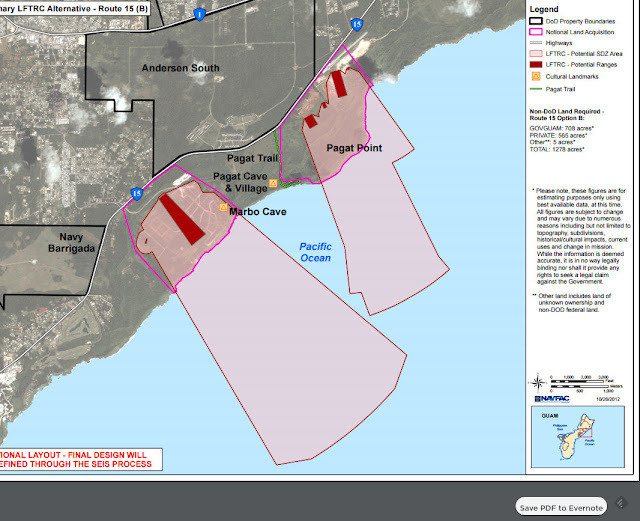 I want to tell you about a place that is beautiful and sacred to the People of Guam, it is called Pågat, and it is about to be turned into live firing range by the U.S. military. It is something that will scar Guam in many ways, and it is the type of action that no one – no one on the mainland, not in any community, would accept. Why should it be different for Guam? And then she would show the reporters the video above and the photos below so that they may begin to understand what America does not yet realize. The biggest anchor to economic development on Guam is its government. As its largest and best paying employer, Guam’s government has a supersize primacy in the island’s life and this distorts its decision-making process about its future. In round numbers, Guam’s total public and private sector payroll is about 60,000 people; of that number about 15,000 receive government-connected paychecks. Federal employment accounts for about 3,600 of that government number. The military buildup’s demand for additional services will increase the government payroll but this will come at a price. By growing its reliance on the U.S. military, Guam's government is also giving the military more control, directly and indirectly, over the island's future. But this loss of control is coming at the same time Guam's potential to shift away from military dependency is increasing. Guam’s most important economic asset isn't the military but the increasing number of well-educated young men and women who have made a deliberate decision to remain on the island, despite other options. Those who remain or return to the island may see their decision as a part of a strong commitment to the island. A larger purpose is assigned the decision. These young people aren’t just thinking about their future, but the island’s future as well and there may be many in this group who appear to oppose the buildup. To oppose the buildup is to make a statement of faith and self-reliance; it is a bold imagination of possibility. And faith in the possibility of a future apart from the military is more important than an actual economic plan because without former, the latter is impossible. Putting aside the issues of the buildup’s impact on sustainability, environment, what are the alternatives to the buildup? Analysis of economic alternatives is where all discussions about Guam’s future seem to fall apart. People can’t imagine something other than the military and tourism as a potential economic pillar. But there may be another option. Guam’s most underutilized asset may be its communication infrastructure; it’s a hub for undersea cables and its online communications services, I suspect, are among the best in Oceana. Guam ability to develop its virtual infrastructure, coupled with its proximity to Asia and time zone advantage (relative to the U.S. mainland), seems to offer some possibility for development of businesses that can provide virtual and regional services. Developing a different kind of future will take a government that can think well beyond a military-dependent future to how it can create a climate that can turn Guam into the Pacific’s mini-Silicon Valley. That will take a government leadership that pushes itself to be creative, imaginative, and forward-thinking about the future. But it is difficult to see how a government focused on counting the buildup dollars is capable of providing inspired leadership on this front. But the raw ingredients for Guam’s alternatives are there. It begins with a supply of young men and women who have deliberately committed to the island, their home, and by opposing the buildup, are also making a courageous statement about their future. It is no small thing in a place such as Guam to oppose entrenched powers. But as been said for time immemorial, fortune, or in this case, the future, favors the bold.